The Beinecke Library is pleased to announce that the Richard Moore papers are open for research; a detailed description of the papers can be found online: Richard Moore Papers. Moore donated his papers to the Beinecke Library in 2009. Richard Moore (1927-2009) a graduate of the Yale College class of 1950, is the author of ten volumes of poetry; a novel, The Investigator (1991); a collection of essays, The Rule That Liberates (1994); and translations of Plautus’s Captivi (1995) and Euripedes’s Hippolytus (1998). Moore’s books of poetry include The Mouse Whole: An Epic (1996), Pygmies and Pyramids (1998), and The Naked Scarecrow (2000). Moore taught at Boston University, Brandeis University, the New England Conservatory of Music, and Clark University. He led the Agape poetry series in Boston and The Poetry Exchange in Cambridge, Massachusetts and Leesburg, Virginia. The collection documents Moore’s literary career and creative process and sheds light on his personal and professional relationships and interests. Papers include writing and professional files; correspondence and subject files relating to literary figures; drafts and manuscripts of Moore’s poetry and prose; and manuscripts of writings by others. The collection includes an extensive journal Moore kept from 1956 to 2007. 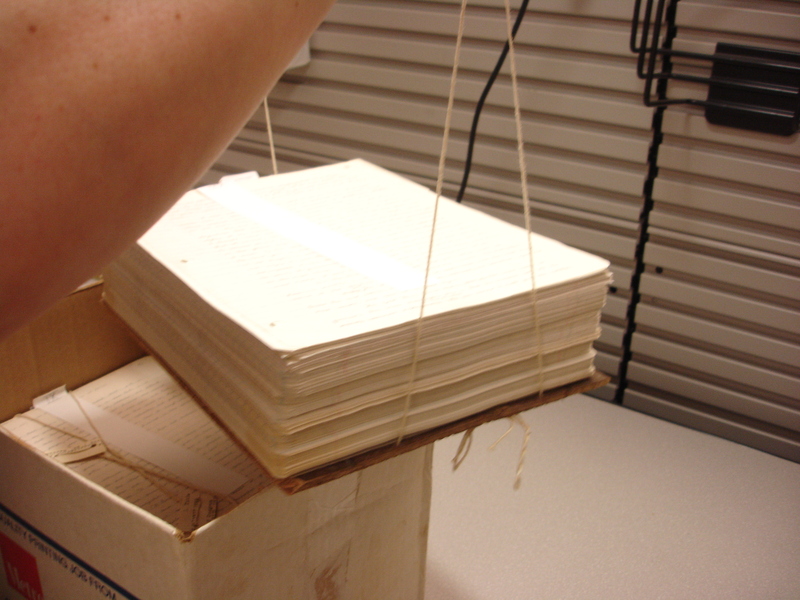 Moore organized the journal with a shelf system made of board and string that allowed him to easily access different sections of the text. 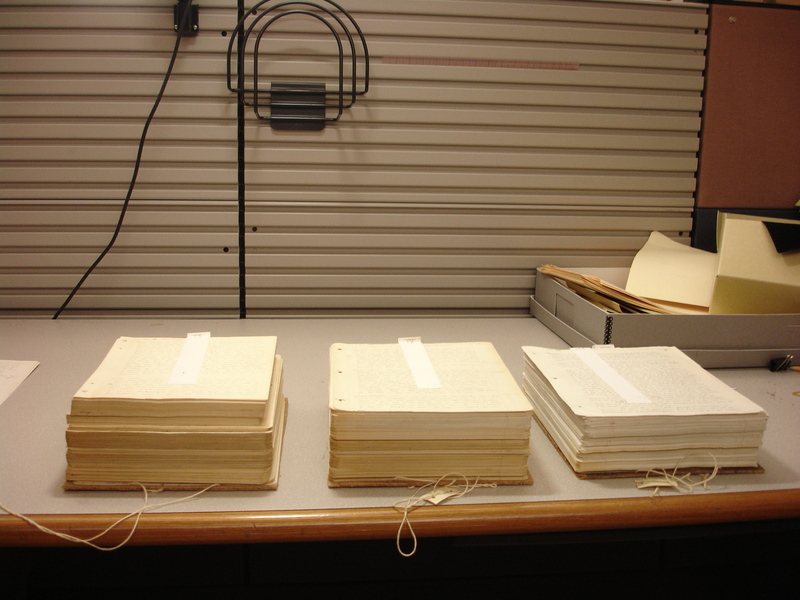 The following video shows Beinecke staff working with Moore’s journal. 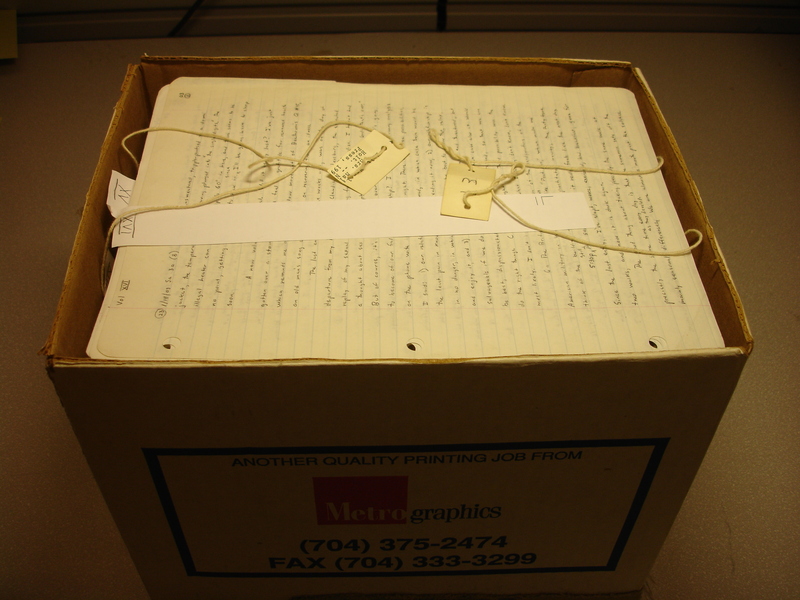 The Richard Moore Papers are housed off-site at Yale’s Library Shelving Facility (LSF) and must be requested 36 hours in advance for use in the Library’s reading room. Please consult with Beinecke Access Services for more information (203-432-2972). Images: Richard Moore’s journal, 1956-2007. Jean Valentine won the Yale Younger Poets Award for her first book, Dream Barker, in 1965; her tenth and most recent book of poetry, Little Boat, was published in 2007. 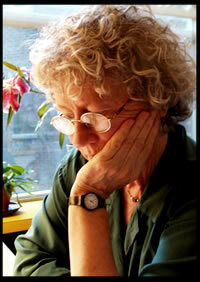 In 2004, Door in the Mountain: New and Collected Poems 1965 – 2003, was the winner of the National Book Award for Poetry. A chapbook, Lucy, was published by Sarabande Books in 2009. A new collection, Break the Glass, is forthcoming from Copper Canyon Books. She was awarded the 2009 Wallace Stevens Award from the Academy of American Poets; she has received a Guggenheim Fellowship and awards from the NEA, The Bunting Institute, The Rockefeller Foundation, The New York Council for the Arts, and The New York Foundation for the Arts. For more information visit http://www.jeanvalentine.com/home.html. For more information contact nancy.kuhl@yale.edu.